By now, we’re all pretty aware of the gap in publishing, and the lack of diverse voices and stories being heard. #WeNeedDiverseBooks really picked up speed in 2014, but the problem remains largely the same. The only way to change it, is to read diverse books. Buy them, borrow them, check them out of the library. Show publishers that we need these voices. We need to step out of our own shoes and into those of someone radically different from us, in a place we may never go. How else will we learn? Sure, these accounts might be fiction, but they are written by real people who really experienced them. I made a list for Bustle of 25 Books (by women!) 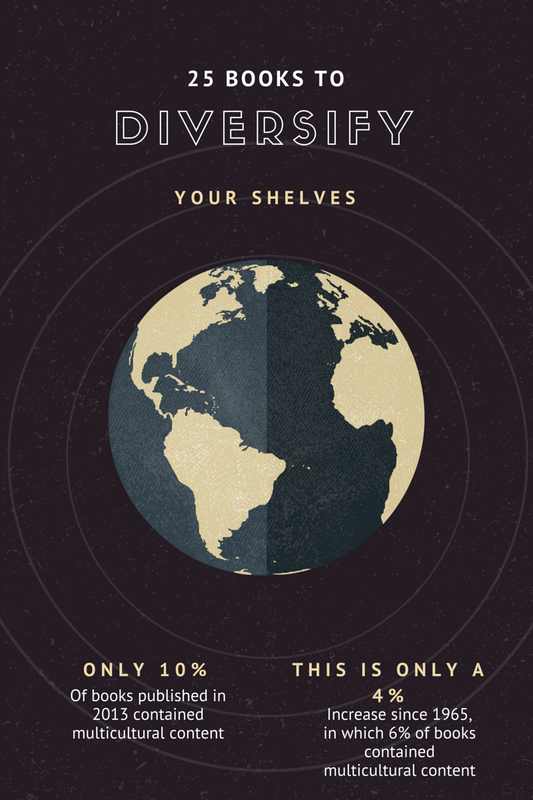 to Diversify Your Shelves. I’m really proud of the way it turned out, and I had a lot of help to make it the best it could be. It’s an international mix of new releases, YA, adult fiction, all written by women within the last ten years or so. Check out the link above and let me know your favorite books to branch out into! I’ve improved over the course of last year but am looking for new voices and books every day! *Info from the graphic is from WeNeedDiverseBooks.org, regarding children’s books. Great list. Of the ones I’ve read, I can say they were all great reads and at least half of the others are on my TBR.